Landscape architecture assistant professor Julie Stevens leads a team of students, offenders and corrections staff in an ongoing project to landscape 30 acres at the Iowa Correctional Institution for Women. Downloadable photo by Christopher Gannon. AMES, Iowa – Julie Stevens recently found an old response to an email request she had sent seeking potential collaborators for a new project. A retired engineer told her in no uncertain terms that the suggested project was doomed for failure, and if she pursued it, she could kiss her career goodbye. “I remember closing that email and thinking, ‘This is not somebody I want to collaborate with.’ I’m glad I didn’t take that advice to heart,” said Stevens, an assistant professor of landscape architecture. "How wrong he was." Wrong indeed. Stevens was looking for collaborators to consult on designing the landscape at the Iowa Correctional Institution for Women (ICIW) in Mitchellville. And she put together a team that is "about as diverse and transdisciplinary as they get." Over the next six years, Stevens, her students and the women at ICIW have transformed the facility’s barren 30 acres into a living landscape of trees, native prairie, vegetables, flowers, butterflies and bunnies. There are outdoor classrooms for learning, quiet spaces for reflecting and fresh produce for eating. By whatever barometer, yardstick, scale, caliper or bushel basket you measure it, the project is a success — and a career-maker. “It’s incredible to me, but the women want to keep doing more projects and the students are still excited to work there. I really thought everyone would be over it by now,” she said. Stevens demonstrates garlic planting for the women. Photo by Christopher Gannon. "I love being part of this team, which is one of the greatest strengths of this project," Stevens said. "This work means nothing without the team." Stevens grew up on a farm in eastern Iowa. As a child, she created rock gardens and dug up plants in the woods to replant around the house. She even constructed a city — complete with bridges, roads and ponds — from scrap wood, rocks and sticks. But she couldn’t be bothered to go indoors when her sister wanted to play Monopoly. After earning a bachelor's degree in horticulture at Iowa State, Stevens completed a master of landscape architecture at the University of Oregon. That's where professor Kenneth Helphand taught her to appreciate the importance of her farm background, which is central to her philosophy about landscape and people's connections to it. "What is most important to me in all my work is the way people connect with the landscape, find respite in it, respect the resources derived from it and care for it in order to perpetuate those resources," she said. “It's an injustice to ask people to live in landscapes that are completely bleached of life and consist of concrete and lawn and have no habitat or ecological value at all,” she said. In her first semester as a lecturer at ISU, Stevens was asked if she wanted to work on a project at the women’s prison. “It just fell into my lap. This has given me an identifiable focus and great opportunities,” Stevens said. Although many prisons partner with university horticulture departments on produce gardens or garden therapy, only two other universities in the United States (University of Washington, Seattle; and University of California, Berkeley) have prison collaborations based in landscape architecture. And both are smaller in size and scope than the ISU-ICIW project. “Landscape architects take a more systems-based approach to design that includes water management, ecology and social factors,” she said. So when Stevens created a new class on prison gardens, she was on the frontier in her discipline — no evidence-based design precedents to research or seasoned mentors to call. Instead, she looked to healing/therapeutic hospital gardens and environmental psychology principles. Cat owners know all about Stevens’ favorite theory ­— prospect refuge. “Cats like to perch in high places to look down and see everything. But they want to stay hidden. That’s basically prospect refuge," she said. Applying the theory is almost impossible in a prison. The offenders know they are always under surveillance, either by a person, a camera, or both. "So we've given them an aspen grove. They can sit under the canopy of trees and still be visible to security officers, but not feel like they're on display. A lot of women use that space. They feel more comfortable there," she said. "All those things are at play in a prison landscape. If they have only concrete, metal picnic tables and lawn, they're exposed when outdoors. But sitting in a grove allows them to relax, focus and not be tense. It relieves some stress ... that's prospect refuge," Stevens said. Stevens identifying a weed for the women. Photo by Christopher Gannon. Everyone connected with the ISU-ICIW landscape project has been affected in some way. Whether it's the graduating students who talked at job interviews about implementing their designs on prison grounds, or students who overcame their anxiety about working 'inside' with offenders. And the offenders take pride in their work and learn vocational skills. Some even plan to study horticulture when released. Stevens and her collaborators (yes, she found some) conducted surveys that showed about 75 percent of the responding offenders use and appreciate the landscape spaces created. "They find places to relax, be calm and think about the changes they want to make in their lives. They say it makes them hopeful," she said. "The year we built the healing garden, a woman on the crew had a reputation for getting in trouble. One day she was upset, and said, 'The old me would've gotten in a fight right now. But I'm not going to because I love the gardens. I want to stay on the crew,'" Stevens said. "And she had no disciplinary write ups that entire summer, when typically she would have had several. That is positive social change facilitated by the landscape," she said. 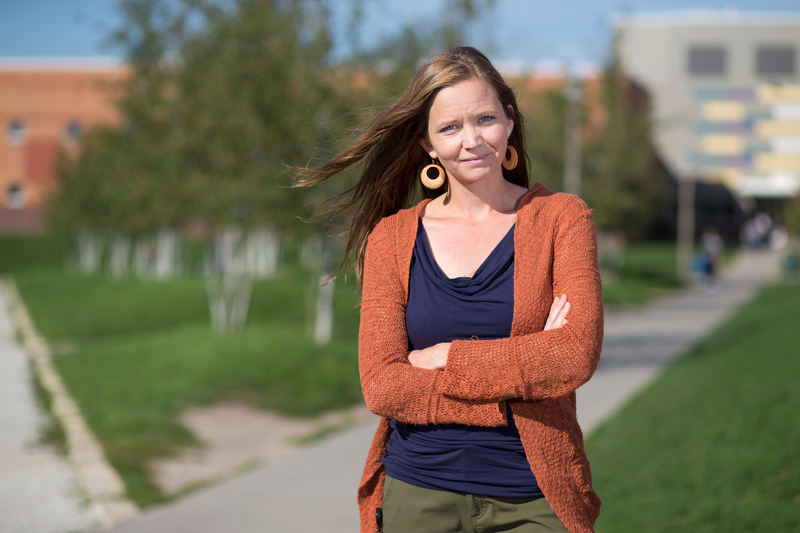 After working with her students to create the master plan, outdoor classrooms, prairie, healing garden, aspen grove, staff patio, production garden, cut-flower garden and greenhouse, Stevens will finally help create the space that made her agree to the project in the first place: a mother-child garden. Next spring, her studio will design an outdoor space where the women can be with their children, picking flowers, tending vegetables or playing on swings and "just have a positive experience together." “One of the first women I met at ICIW told me that her parents taught her to make meth when she was eleven. My parents taught me how to garden and build,” Stevens said. "The mother-child garden will allow them to be outdoors, relax and share conversations. It can incentivize the children to visit again, play with mom and check the garden seeds they've planted together," she said. Then, she may turn her sights to juvenile correctional facilities and mental health institutions. She already started working with the men's maximum security facility in Fort Madison. "They all need improved outdoor environments," she said. "There's no shortage of projects with these facilities." Stevens says the ongoing success is largely due to all the time she and her students spent at the prison. “That’s the take home here — you’ve got to be there, spend time with people, ask lots of questions, actually listen to their answers and you have to care about the people you work with." Over the past six years, Julie Stevens, her landscape architecture students and the women at Iowa Correctional Institution for Women have transformed the facility’s barren 30 acres into a living landscape of trees, native prairie, vegetables, flowers, butterflies and bunnies. There are outdoor classrooms for learning, quiet spaces for reflecting and fresh produce for eating. "What is most important to me in all my work is the way people connect with the landscape, find respite in it, respect the resources derived from it and care for it in order to perpetuate those resources." 2014 crew of ICIW women and ISU students. ISU landscape architecture students and Mitchellville prison ..
Tomas-Gonzalez-Torres is back on campus after working as a NASA flight director. Baskar Ganapathysubramanian wants to revolutionize science through simulation.